Military Millionaire Strategies – First Term Wealth! I wrote an E-book recently, detailing all of the financial decisions I SHOULD have made in my first enlistment. These strategies could make you a military millionaire. I have served in the United States Marine Corps for over ten years, and throughout that time I have learned a lot about personal finance and investing. I have earned my certificate as a Command Financial Specialist and at the time of writing I own over 50 rental units with a combined value of over $3,000,000! That being said I made the same terrible financial decisions in my first four years of service that a lot of my peers did! In my first enlistment, I bought three tattoos, a 20-year-old truck, two 20-year-old (beater) cars, a rifle, shotgun, pistol, and a new Harley-Davidson motorcycle. Of these items, I totaled the Harley, and one car sold the other car (at a loss) and haven’t been able to take my rifle or pistol to 2 of my last 3 duty stations (clearly not a wise investment). I spent over $26,000 on items that I didn’t need. This does not include the amount of alcohol I purchased being stationed in Okinawa, Japan…or the number of supplements I bought…or the amount of times I ate at the food-court instead of the chow-hall. The point is, I had no money saved at the end of my first four-year term in the Marine Corps. 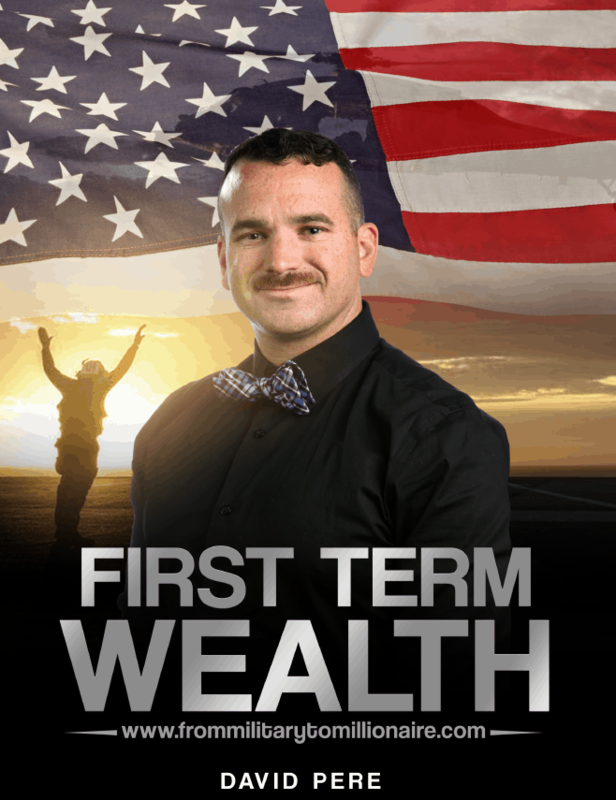 Download First Term Wealth, in order to start your journey to become a military millionaire! In the planning stages of this book I did a short survey with some veterans that made very smart decisions in the early stages of their career, and some of their results are staggering. The general consensus is that you should be able to save around $50,000 in your first term (not including your TSP), and still be able to have a few drinks with the guys every week! I placed the rest of these results on the first page of the E-book! The savings gap is a simple concept that will change your life! Increasing your savings gap is the easiest way to dramatically improve your financial situation. Too often people get wrapped around their minimal income but fail to realize that the real problem is their mismanaged expenses. Focus on minimizing your expenses first, and then improve your income (without increasing expenses). The fastest way to pay off any debt you may have accumulated is to pay only the minimum payment on all of your debts, except for one. Now, put every available penny into paying off this one debt. Roll the payment you were making into the next debt, as soon as you pay off the first! With each successive debt paid off you will be able to make a larger payment on the next debt (this is the snowball effect)! I can’t give away the whole book! Download it to hear about how I use these specific benefits! Here is an article I wrote on the Blended Retirement System as well. These are the three strategies for TSP/Savings allocations that you need to know about! Please note that all of these numbers are based on the paycheck of an E-1 with less than two years of time in service to date. As you get promoted, and receive the 2-year, 3-year, and 4-year pay-raises I hope that you will increase the amount you’re saving, as discussed above. This strategy is easy to stick to because it will leave you roughly $862.05 in monthly spending cash. I would personally recommend only starting with this strategy if you have large debts to pay off. In that case, I would use as much of your “spending cash” as possible to pay that debt off quickly. Then upgrade to one of the more powerful strategies as soon as your debt is gone! Without including promotions, pay-raises, or interest this is what you will have saved after your first 4-year enlistment with this strategy! The Intermediate and Extreme strategies are even more powerful! Increasing your savings rate in order to save over $60,000 dollars, even if you never get promoted! $60,000 of investment capital can go a long way in helping you become a military millionaire! To see these strategies, along with my strategy for bonuses, and side-hustles to increase your wealth…you know what to do! You can save a ton of money in your first enlistment in the military! In order to do this you have to be intentional with your savings and investment strategies. If I had done this I could already be a military millionaire! Last chance to get your FREE E-book don’t miss out!